The largest performance studio at the Fernando Alonso National School of Ballet in Havana, Cuba, is packed with lower school students, seated helter-skelter around the edges of its new sprung floor. They move over to make room for photographers and visitors in town for the 26th Havana International Ballet Festival, who have come from as far away as Mexico, England and the United States. They are all at the academy, known world-wide for its rigorous adherence to a scientific methodology painstakingly developed by ballet master Fernando Alonso, because Aurora Bosch is giving a mixed-level master class to the upper school, of which she is a graduate, becoming one of its first teachers at the age of 19. 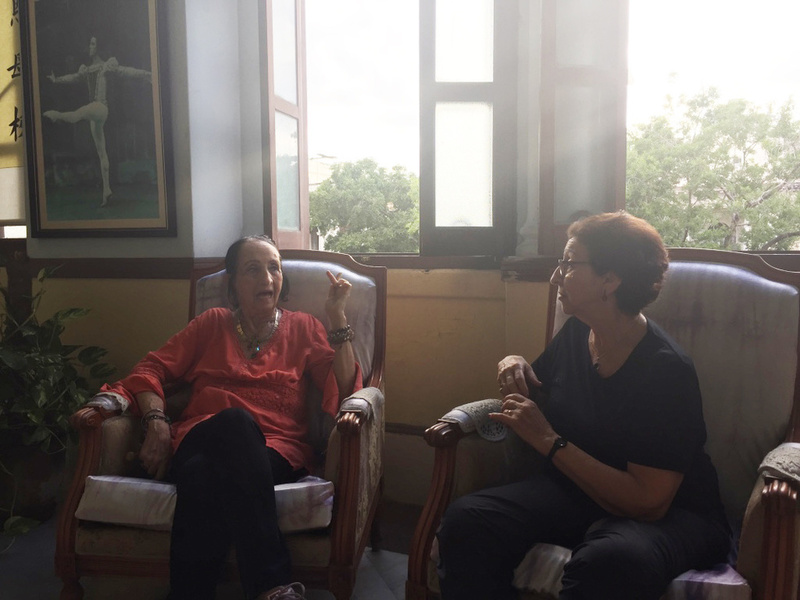 Bosch, known as one of the "Four Jewels" of the Cuban National Ballet (along with Loipa Araújo, Josefina Méndez and Mirta Plá), is now based in London, but earlier this month she returned to Havana to attend and participate in the festival. Shortly afterwards, the school's director Ramona de Saá invited me to speak with her and Bosch about the expanding focus of this distinguished school that has produced such outstanding dancers as Carlos Acosta, Lorena and Lorna Feijóo, José Manuel Carreño, and a host of others who have danced with first-rate companies the world over. Ramona de Saá and Aurora Bosch at the Fernando Alonso National Academy of Ballet. Photo by Jim Gotesky, Courtesy Toba Singer. Apart from classical technique, which classes do you feel benefit your students most? Ramona de Saá: We are living and teaching in times when giving a boost to contemporary ballet, character, and ballroom is becoming more and more important. Styles other than classical ballet have always been in our curriculum. But now we are also trying to find experts in them, in line with the kind of work that is currently being created and which our graduates will be dancing during their careers—not only in Cuba, but internationally. It is good for their training and develops in them a respect for those genres. We are giving Spanish dance class. We have also been invited to the Cuban Art Factory, a local arts center, to do a contemporary piece by a French choreographer and we chose a group of boys, who are quite enthusiastic and were very warmly welcomed. This month, we will present a piece by contemporary choreographer Laura Domingo there. Most interesting is how attractive these programs are to the public! We are delighted to be educating audiences to a wider aspect of our culture and the dance spectrum. Aurora Bosch: I agree. We have a saying that "The time draws the journey." Though we are from another generation, we have to be open, because the world is changing, and with it, the language of dance. Remaining open to these changes and welcoming them is important, while at the same time not losing our roots, so that in preserving that continuity we are able and free to ensure a high level of quality in our performances. This national school continues to be well-run, inculcating a disciplined approach to the study of classical ballet, and so there is no danger of that getting lost if we enhance our curriculum. Internationally, this emphasis on the contemporary has been under way for quite some time, and we have a lot to contribute to it, artistically, and because of the solid foundation our training provides. 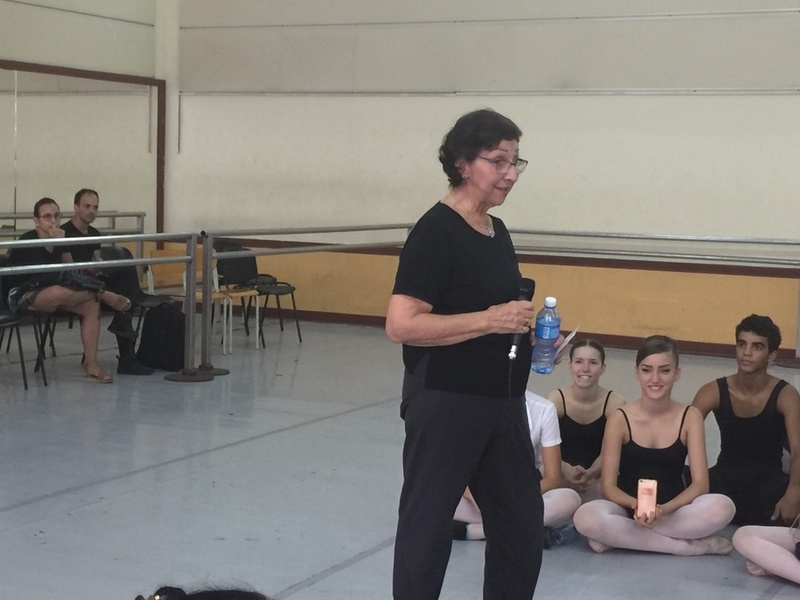 Aurora Bosch with students at the Fernando Alonso National School of Ballet. Photo by Jim Gotetsky, Courtesy Toba Singer. RDS: The response from our students and the public has been pretty spectacular, and that pleases me very much, because this was not always the case. There was sometimes a tendency to discount contemporary work and our students suffered as a result. Now they have a lot more information about the genre. They've learned to appreciate work by contemporary choreographers, they're very interested in dancing it, and they want to arrive prepared. AB: I'd like to add that I think that the Blues is a very, very important dance style for us to teach—your readers may not know that the Blues has roots in our culture that grew over into yours because of its proximity to the Southern United States, where many Cubans lived before and after the 1959 revolution. From left: Aurora Bosch, Loipa Araújo, Mirta Plá, Josepfina Méndez, Ramona de Saá and Margarita de Saá at the Cuban National Ballet, 1959. Photo Courtesy Dance Magazine Archives. What is the relationship between technique and artistry in the context of a rapidly changing culture? RDS: So often in today's culture things are too accelerated. You see this a lot at competitions. Sometimes a student who is very young and inexperienced is matched with a partner with whom she has never danced. They have to be prepared to put it together themselves at the last minute. This is today's world! I don't mind taking students to competitions because they learn a lot, but I think I may be allergic to them [laughs]. Sometimes, unbeknownst to them, very young students become victims of disagreements among the jury's adjudicators, many of who are there for only one reason: to "go shopping" for talent to add to their school or associated company. As a result, the students can become demoralized when the outcome doesn't favor them through no fault of their own. AB: Students are living in a very different culture than the one we grew up in, when we received our training. The pressures were such on our company that as we learned ourselves, we also learned to teach. The traditions, in all styles, were established over the generations, and we perfected a method, under Fernando Alonso's practiced eye, of transmitting what we knew to the students. Today's world has a multiplicity of influences, and our students are eager to respond to them, but it is harder for them to meet the variety of demands that are made on them. RDS: Yes, they have their mobile phones and an entire technology that absorbs them and so much of their time. We have to recognize that it is a kind of addiction, but we also have to acknowledge how it has altered their vision of the world. It means something important to them artistically, so from our foundation, we must let it become part of the oeuvre. We are, after all, in a position to support it with a base that is sufficiently algebraic to enable them to become the best dancers they can be in an exciting and rapidly changing culture.